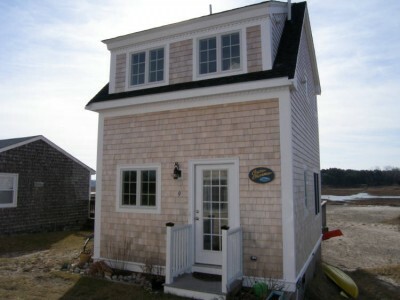 Marshfront 2 Story cottage just across the Boulevard from East Sandwich Beach. Great views and perfect spot to spend a week at the beach. Bring along your kayak or rent one locally to paddle from your back door out to the Bay. All new in 2008! Brand new kitchen, gas fireplace, 90 sq. foot loft, great deck and outside shower. All new in 2007 with brand new kitchen going in now that includes corian counter tops.Adorable expanded cottage that sits directly on the ever changing tidal marsh. The views are fabulous! Bring your kayak and paddle Scorton Creek or out to Cape Cod Bay. Great enclosed outdoor shower and a deck to relax on. Walk across the street to beautiful East Sandwich Beach. Enjoy 2 story living with a 90 sq. ft loft for extra sleeping. This cottage has A/C and a gas fireplace. Living room has great comfy furniture including a chaise for lounging. The main bedroom has a Double sized bed and bunk style beds that total 3 twins being built now.Bonus is the new washer and dryer. 50% of rent is due upon making reservation. The balance including the refundable security deposit is due 30 days prior to arrival. A refundable $250 security deposit also applies.